Here are our current varieties of jam and sauces. 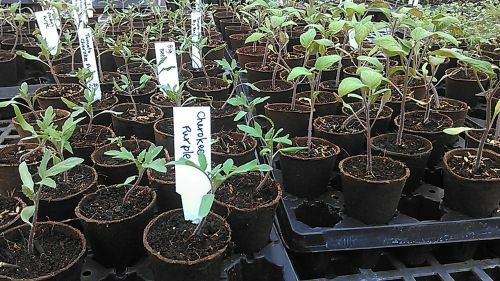 All are made using our farm-grown products where possible and are made in very small batches by hand. We are grateful to have the support of YMCA Camp Hanes who graciously let us use their terrific camp kitchen for our jam-making. As an expression of our gratitude, we donate a portion of each jar of jam sold to their Send a Kid to Camp Program! Old Fashioned Raspberry Jam: This delicious jam bursts with the full taste of fresh raspberries. It is simply raspberries, sugar and lemon juice – the kind your grandmother would make! Enjoy it with toast or biscuits or stir it into your yogurt or oatmeal! You will love this local, small-batch delight! One of our best sellers! Available in 9.5 ounce and gift-size (4.5 oz.) jars. Raspberry-Baby Ginger: This amazing jam blends the full, rich taste of raspberries with the bright, crisp taste of baby ginger – what a perfect combination! 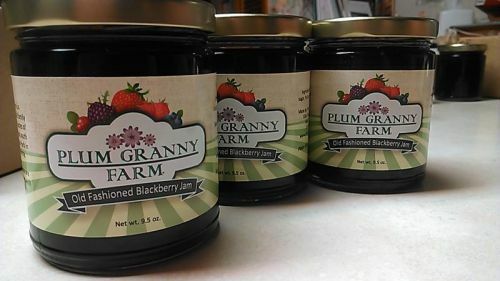 One of Plum Granny Farm’s best sellers. In addition to being great on bread or in yogurt, this jam makes a great vinaigrette salad dressing. Available in 9.5 ounce and gift-size (4.5 oz.) jars. Old Fashioned Blackberry Jam: The rich, intense taste of our Triple Crown Blackberries (a farm favorite!) is simply highlighted with sugar and lemon juice. This is a very fruit-full jam – twice as many berries as sugar! Most of the seeds are removed leaving a smooth, summer-fresh jam for your morning toast or yogurt. Available in 9.5 ounce and gift-size (4.5 oz.) jars. Raspberry-Chipotle Chile: Accent your jam with the sultry, smoky flavor of chipotle chile for an amazing taste experience! The berry sweetness pairs beautifully with the south of the border punch of chile – it’s not hot but you know it is there! This jam pairs nicely with cheese and is also a great base for sauces and marinades – let your imagination go olé! Available in 9.5 ounce jars. Raspberry-Cranberry: Sweetness and tartness in one beautiful package! The main players are highlighted with oranges and baby ginger for a delightful treat. Of course it’s great with bread but think about how it will highlight your Holiday turkey or ham – better get two! Available in 9.5 ounce and gift-size (4.5 oz.) jars. Seasonal Specialty! Baby Ginger-Strawberry-Mint: What a unique and wonderful combination of our farm-grown organic baby ginger and strawberries mixed in with a hit of mint! Absolutely amazing with toast and a yummy addition for yogurt. Not your everyday jam -- but good enough to eat every day!! Available in 9.5 ounce and gift-size (4.5 oz.) jars. Limited Edition! Yam’s Jam – Sweet Potato Butter: The creamy smooth taste of organic sweet potatoes and spice. Almost like a pie in a jar – but not quite as sweet. Seasonal Specialty! Available in 9.5 ounce jars. Raspberry-Roselle Jam: Our raspberries are blended with the buds of roselle flowers (a kind of hibiscus). It is a sweet and tart treat bursting with sunny summer flavor. Very limited quantity! Available in 9.5 ounce jars. Raspberry Chipotle Molé Sauce: The sweet taste of raspberries and cocoa is followed by the smoky spice of ancho and chipotle chile. An excellent cooking sauce for pork, chicken, turkey, black beans or shrimp. Kick your holiday cooking up a notch or two with this great molé! Limited quantity!